The replacement figma – How Do You Figure? I came home today only to find an interesting bundle sitting in the middle of my driveway. It seems that the postman had put a package in a plastic bag (it was raining most of today) and dropped it off on my driveway. It was blocking my car from getting into the driveway, so I had to retrieve it before coming in. 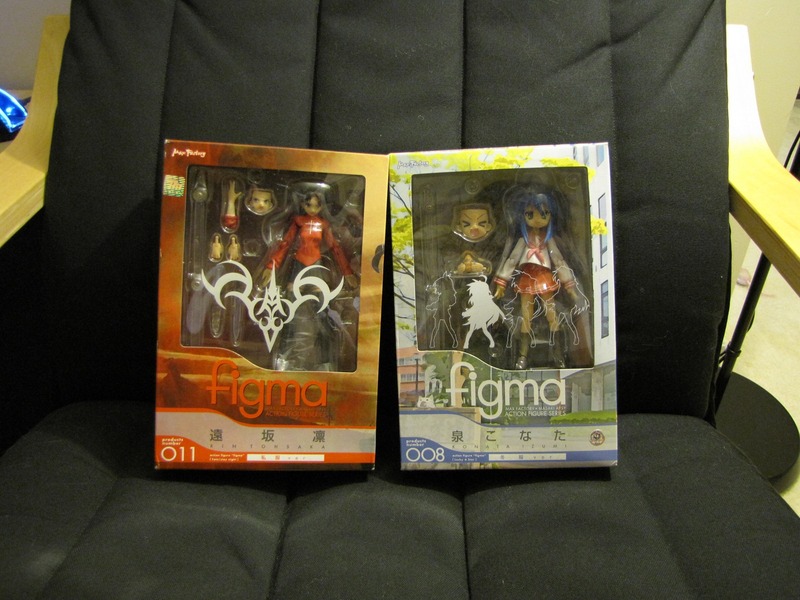 It seems that my two figmas had arrived from eBay! To get to them, I had to go through several layers of packaging. The outside was wrapped in thick paper, which was covered in tape. Inside was two cardboard boxes wrapped together with tape. Once I got the boxes open, there were layers of bubble wrap. Lastly, each figma box was wrapped in tissue paper. Talk about thorough! As a result, both arrived intact and in good condition. I immediately set to opening them up, checking them out, and posing them in all sorts of interesting ways. 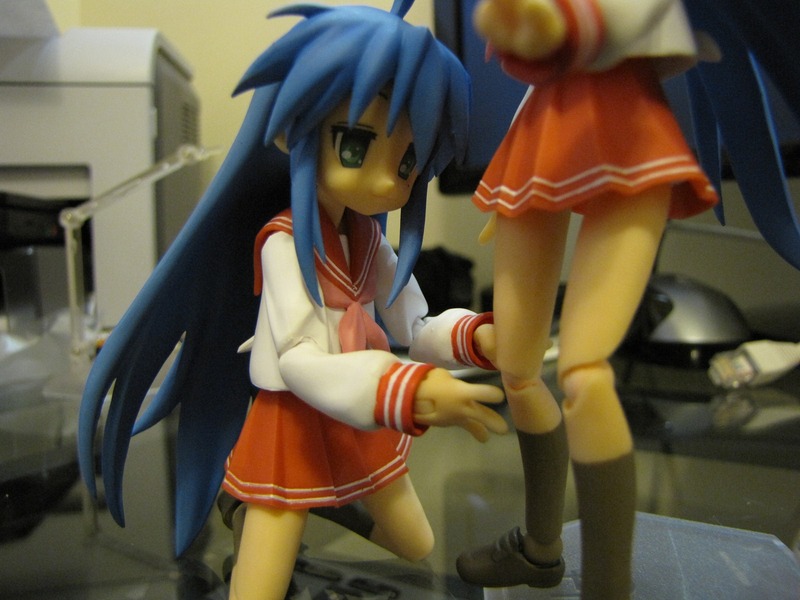 I had actually purchased the Konata figma to replace the one I had broken a few weeks earlier. 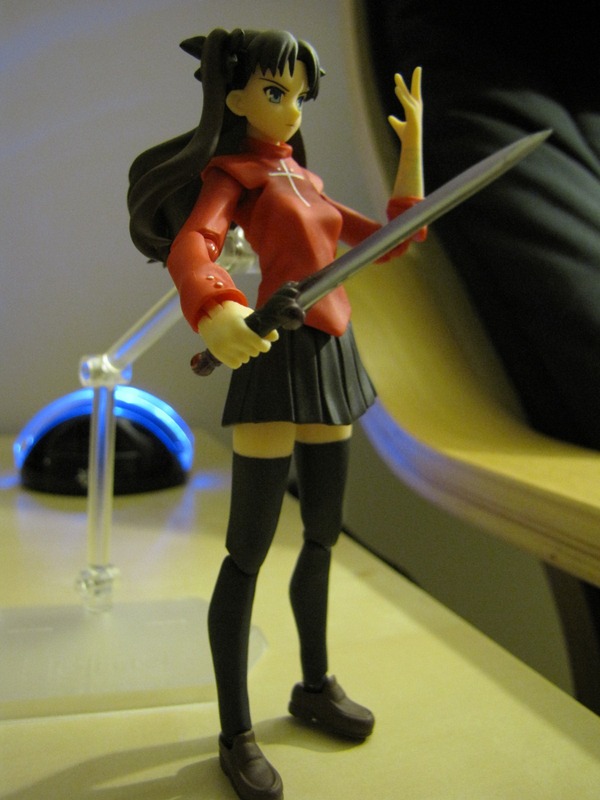 Rin just happened to be sold by the same seller for a reasonable price, and I’d save a bit on shipping. 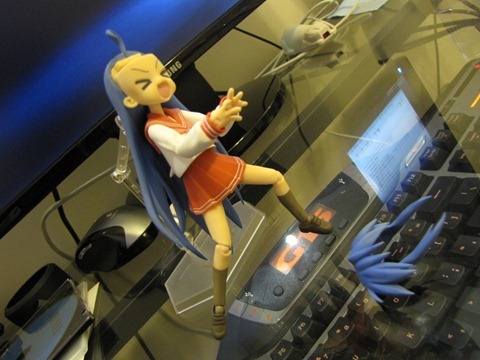 It seems that the Konata figma suffers from a loose front hair piece. Both of the ones I have fall out pretty easily, making them less than ideal to carry around for excursions. Tsuruya-san also has the some problem, and I’ve almost lost it a couple of times when taking her outside. Enough of Konata for now, time to take a look at Rin! 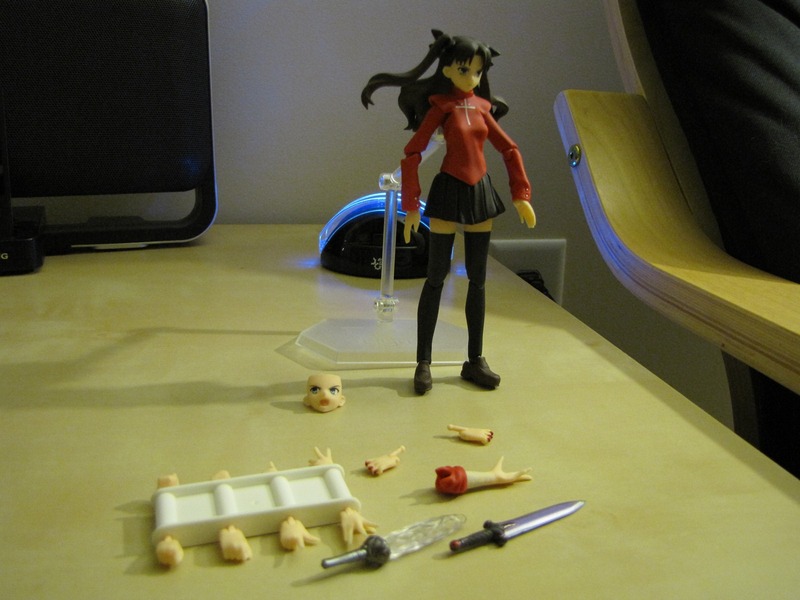 Rin comes with quite an assortment of accessories. Besides the standard set of hands and extra face, she comes with two daggers and an extra arm. The arm itself is fairly detailed, featuring etchings of a spell casting. In addition, the ponytail pieces of her hair can rotate, giving her a sense of motion. In all, a pretty nice piece of design. The secondary arm, however, is a bit difficult to attach since the sleeve is actually separate from the arm. 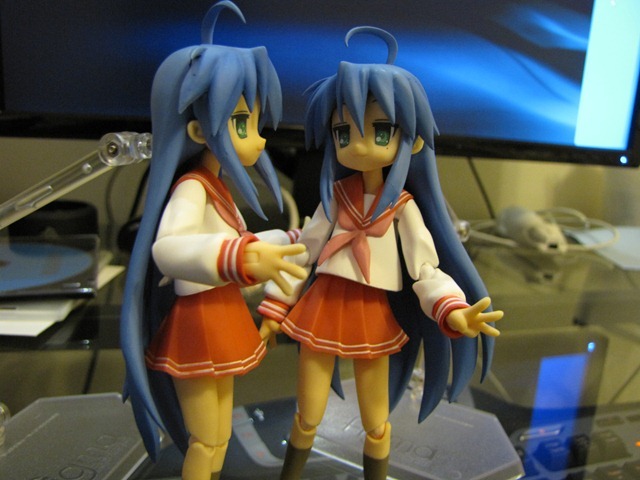 The Konata twins actually look very cute together. Especially when they interact with each other. 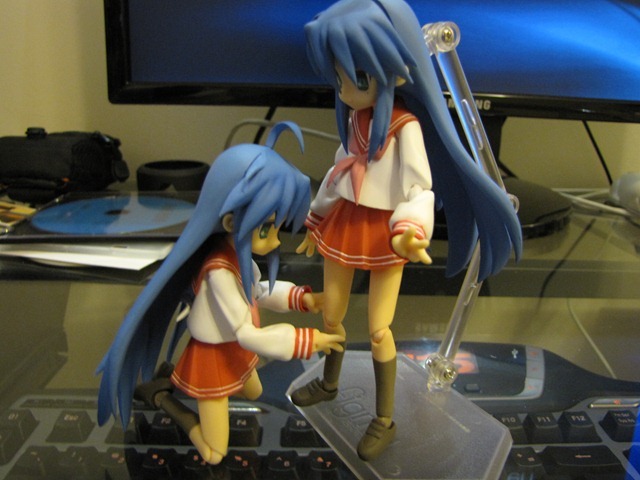 Kinda makes me wish that Konata actually had a twin, just to see the antics they would get in to!!! If the were both fully poseable, I’m sure all sorts of interesting situations would ensue… Sadly, one of them can’t bend her leg, so she’s pretty much relegated to the one position. As for Rin… S-Words for $400 Alex! Pingback: Buying figures on eBay (with Bing Cashback) « How Do You Figure?